Planispheres (Star Maps): Paper or Electronic? A topic that comes up a lot is discussion about what makes a good astronomy helper application. Whenever we suggest purchasing a paper Planisphere our critics remind us that they are not necessary because “there is a great app” to do that. We take exception to the “there is an app for that” assertion… but perhaps not for the obvious reason. In fact we DO use several apps for forecasting and navigating the night sky. But ultimately we find the good old fashioned planisphere to be the most effective for most of what we want to do. We’ll make the case for a paper (or plastic) planisphere in a moment. Why Do We Want Something Besides our Eyes? We are a beginner and we really don’t know Canis Major from Major Appliances. We have some familiarity with some of the constellations, but we want to learn more. We want to take a shot with a particular sky object behind a particular landmark. Even though we know the night sky pretty well, we still need to be able to find faint objects, or find objects in less than dark skies – the Milky Way, for example is difficult to see unless conditions are good and the sky is dark. We are going to go to an unfamiliar place with a latitude that is very different from where we normally gaze at the night sky. We want to know where to look to observe a particular phenomenon like the Geminid Meteor shower. Can’t I Do that with an App? Unless you keep the app brightness really low or use it in a “dark sky mode” (usually dim red), you’ll damage your night vision making it difficult or impossible to see dimmer objects in the night sky. If you’re trying to find the Milky Way (the dense part in Sagittarius) but you try to use the app during a period when the Milky Way is not visible. 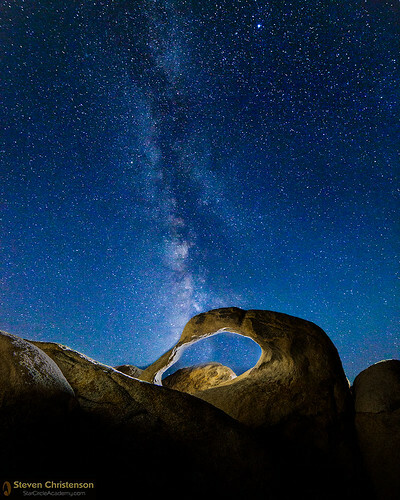 No matter what time of night you enter, you won’t see the Milky Way (e.g. November through January). The representation on the app is often NOTHING like what it may look to your eye in your location. Every app suffers from this problem in one way or another. Some apps make the Milky Way in Canis Major appear to be incredulous – actually its very sedate there. You want an idea when it will be BEST to get the Milky Way aligned over your target. But on an App you will need to determine the time manually. If you mistakenly trust the app to tell you where it’s pointing you may be surprised how wrong it can be. Due to iPhone, Android, and iPad hardware limitations, a handheld app could be anywhere from close enough to off by 180 degrees! It will be even worse if for some reason your App is configured for the wrong timezone, or the wrong GPS location. True story 1: I happened on a family in Yosemite, California and the dad had out his iPad pointing out to his children: “see … there is Orion”.. and over there…” but he was from Alabama and his iPad was off by 3 hours – and his compass wasn’t calibrated either so he ended up almost 180 degrees off. Dead battery. If you have to choose between enough battery to make an emergency call or figuring out your night sky… well, we recommend saving the battery. Most apps show only a fractional portion of the sky which may confuse anyone who is not already familiar with the sky. While we freely admit that we like and use the following applications, we prefer a paper/plastic Planisphere. Stellarium – FREE runs on Mac, PC and Linux. We like it because it has excellent sky condition simulations that help give a realistic view of the night sky. It won’t show you dim stars under bright moonlight unless you ask it to. It can also track comets and satellites. What we don’t like is that it is fidgety to configure. StarMap by Fredd software for the iPhone/iPad. We like this one because it’s quite complete. It is well organized to show you, for example, what meteor showers are visible, what “dimmer” objects you can find, and has a simple interface for adjusting the sky brightness or the time of day. What we don’t like: we like to call the constellations by their scientific (and we believe) more common names. Herdsman? That’s Bootes. Big Dog? That’s Canis Major, thank you. Note there are TWO versions of this App, unless you’re a serious astronomer, the less expensive one will work. GoSkyWatch – admittedly we like it because we got it as a free app through Starbucks app of the week but we think its worth the price anyway! We like that it’s pretty versatile, when you point it at the sky it gives the altitude and azimuth (elevation angle and compass direction) which can come in quite handy – even though as we’ve already noted the compass direction is probably wrong! Zero in on an object and it will give you and idea what it looks like. We like that it’s Milky Way representation – while overly bright is pretty close to what it looks like. You won’t confuse Canis Major with Sagittarius, for example. It also includes a great assortment of dim objects and shows constellations with “good names” not just the “common name”. It also has a night mode to conserve your night vision. It doesn’t have meteor showers or satellites, however. We’re not fond of anything we haven’t listed. Not that there aren’t better apps, but every one we’ve tried falls short in some way. Take for example, SkySafari. SkySafari for example, is mostly a disappointment. Not only are there 12 different versions for iOS that range in price from $1 to $40, but the app doesn’t do a good job simulating the night sky, prefers to show useless images of the mythological constellations (which fortunately can be turned off) and shows a garish orange Milky Way which might be exciting to look at except that it will never look like what the app reveals. SkySafari also doesn’t adjust for the effects of twilight or moonlight. SkySafari does have some nice information about each object in its database, but the database is not searchable. If you’re interested, for example in M101 you’ll have to scroll all the way to the bottom of the Messier Catalog page. If you want to catch a glimpse of the ISS (Zarya/Space Station) you’ll have to slog through the Satellites page. In this day and age it’s pretty normal for people to navigate by GPS, not by map or even by written instructions. It’s convenient to rely on devices. But we have driven to places and had NO idea how we got there except that “Mr. Carson” – our pet name for our British Accented “voice” – told us where to turn. In other words, we accomplished the goal of getting somewhere, but not really learning the geography, or even getting a good sense of direction. And we trust our GPS at a potential cost: the instructions could be WRONG, or dangerous, and our device might die. True story 2: we accidentally wiped our handheld GPS track when our goal was to return through a heavily fogged in trail at night – depriving us of the very bit of information that we needed! We lived, obviously, but took several wrong turns as a result. First we like the Planisphere because it is indeed a Map. You can study the Planisphere day or night and observe what constellations are near other constellations. A planisphere is in fact a rotating map. Unlike directions to grandma’s house, the appearance of the night sky changes minute by minute and season by season because of the earth’s rotation and the earths path around the sun. While you know you can always turn left to get to grandma’s house, what you want to find in the night sky may in fact be “upside down” from what you remember 3 months or six hours ago. From a larger map like a Planisphere you’ll discover that lining up Rigel to Betelgeuse (in Orion) and keeping straight will get you to Castor and Pollux in Gemini. Following Orion’s “belt stars” toward the Rigel side will get you to Taurus and from there if you keeping going you’ll find the Pleiades… and so on. You’ll learn that you can navigate to the stars WITH the stars. A Planisphere also has a very powerful do-it-once approach to aligning things in the night sky. Spin the wheel to the sky configuration you wish and you can read around the edges every time of night over about 5 months in which the sky will appear in the same configuration! No app we’ve seen does that! 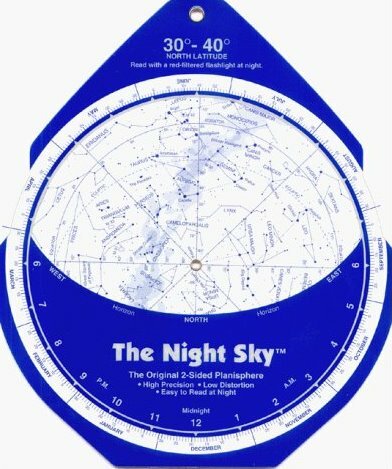 In fact, we use the Planisphere to decide when the Milky Way will appear over our favorite waterfall or when Andromeda will be high in the night sky so we can snap it’s picture with the minimum amount of atmospheric distortion. The planisphere doesn’t tell us about the moon, but it does give us all the dates we have to work with. An app must have the correct location and timezone – which you may have noticed in True Story 1 can easily be quite wrong, a Planisphere is based on your local time. The only parameter you have to get right is to match your latitude with the proper Planisphere chart. If you live in San Francisco, you’ll want a chart that is valid from 30-40 degrees, not one that is 40-50 degrees and thus more suitable to Seattle residents. The most often made mistake on a Planisphere is to not subtract an hour from the time shown on the chart during daylight savings time. Some charts have the daylight savings time equivalent printed on them, but if not, just remember that during the summer if the watch reads 9 PM, you dial the chart to 8 PM. The universe does not suddenly lurch 15 degrees when we decide to artificially set the time ahead an hour! The one unfortunate thing about planispheres is that not all are created equal. We prefer DH Chandler’s LARGE charts because they are double sided and have less distortion than the single-sided charts. While it might be counter-intuitive to create a chart of black dots on a white background to represent the stars, it’s actually easier to read at night with a red flashlight than a chart with white stars on a black background. You can get DH Chandler’s charts from Amazon for about $13 and from many other retailers. If you join us for any of our events, we always have a supply on hand for our students. This entry was posted in Astrophotography, Maps, Ravings, Review and tagged apps, compass, GoSkyWatch, GPS, inaccuracy, night sky, planispheres, planosphere, sky map, SkySafari, Star map, StarMap, stellarium, tools on May 29, 2014 by Steven Christenson.